Take a trip to China without even leaving your home to experience the unique culture that this amazing country has to offer. Click here to play! Take in the sights and you could walk away with plenty of money in your pocket. You can’t visit China without encountering the Geishas. These cultural beauties are a substitute symbol and will replace all other symbols (excludes scatters) to help you create more winning lines. You’ll also want to visit the ancient pagodas found across the beautiful landscapes. These traditional buildings will bring in up to 2500 times your line bet if you can spin two or more across an active line. Also watch out for paper lanterns, and many more to help you in your quest for cash. Spin in the cherry blossoms, as these delicate flowers are scatters. They will not only multiply your total bet, but they will also trigger a number of free games if you can spin three or more anywhere on the board. So, travel across China for a chance to take in the rich culture and more than a little bit of extra cash. 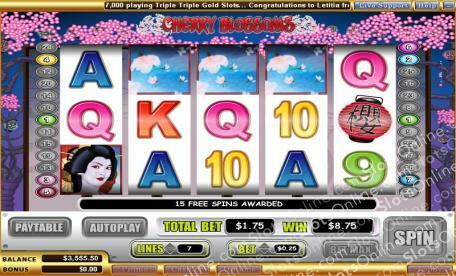 The pink cherry blossom is a scatter symbol. Spin two or more anywhere on the board to multiply your total bet by 2, 5, 20, or 200 respectively. Spin three or more anywhere on the board and you will trigger up to 25 free spins. The Geisha is a substitute. This mysterious beauty will replace most other symbols (excludes scatters) to create more winning combinations. It will also payout a massive 12500 times your line bet if you can spin five of them across an active payline.